Russian messages are printed in wrong character set. kiav added projects: gnupg, Bug Report. kiav added a subscriber: kiav. We always output plain UTF-8 on Windows. 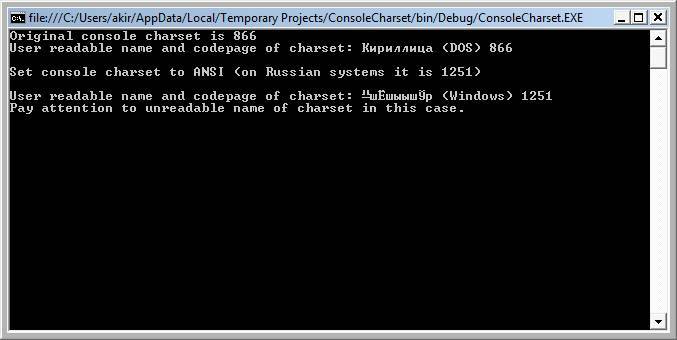 As I can see - the right charset for Russian systems is 866 (CP866). libiconv to translate between charsets. The output is CP866. So GnuPG should correctly recognize console charset. According to libiconv documentation, it recognizes CP866 as legal charset name. but GnuPG prints unreadable text! I copied some text output from console to Notepad.exe (standard Windows program). encoding and ibm866 as 'displayed as'. I do not know what does it mean. A test program compiled with MinGW under Windows gives the same result - CP866. I used just 'gcc console.c' and ran a.exe in MinGW Shell. because GnuPG for Windows can be compiled using cross-compiling only. A fix for this has been included in gpg4win 2.2.2. Does this now also work for you? I've only tested it with the Codepage for Germany. Does this now also work for you?